Functional gastrointestinal disorders (FGIDs) are a group of conditions characterized by the dysfunction of the gastrointestinal (GI) tract. Although the specific pathogenesis of FGIDs is unclear, several theories have been proposed to explain the symptoms. Abnormal GI motility and visceral hypersensitivity have always been considered to be the main physiopathologic basis of FGIDs, and FGIDs related to psychomental disorders have also caused a major social concern. In recent years, a growing number of researches have proved that cytokines have a significant influence on GI motility, and the role of cytokines in FGIDs has aroused more and more attention. In this article, we discuss the interaction between immunoinflammation and FGIDs, and make an overview of current studies. 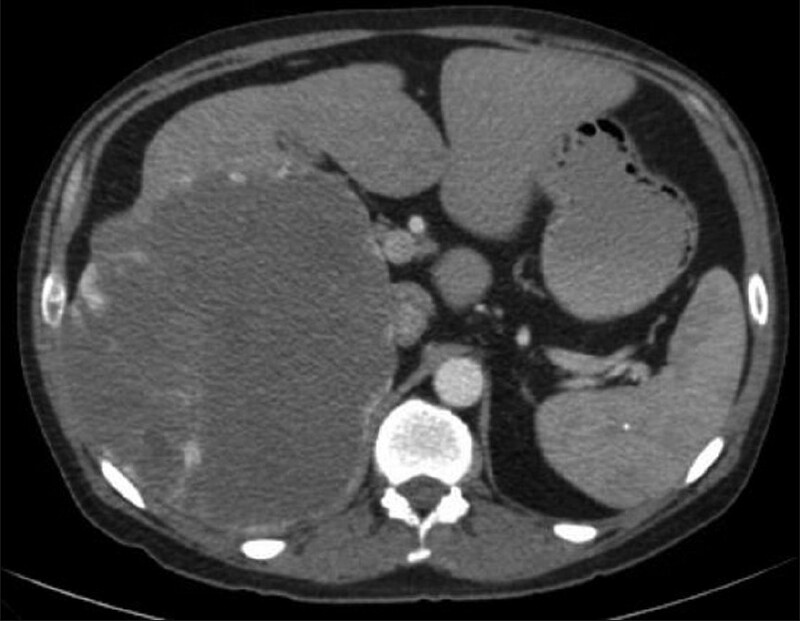 Choledochal cysts are cystic dilation of extrahepatic duct, intrahepatic duct, or both that may result in significant morbidity and mortality, unless identified early and managed appropriately. The incidence is common in Asian population compared with western counterpart with more than two third of the cases in Asia being reported from Japan. The traditional anatomic classification system is under debate with more focus on etiopathogenesis and other aspects of choledochal cysts. Even though categorized under the same roof, choledochal cysts vary with respect to their natural course, complications, and management. In this review, with the available literature on choledochal cysts, we discuss different views about the etiopathogenesis along with the natural course, complications, diagnosis, and surgical approach for choledochal cysts, which also explains why the traditional classification is questioned by some authors. 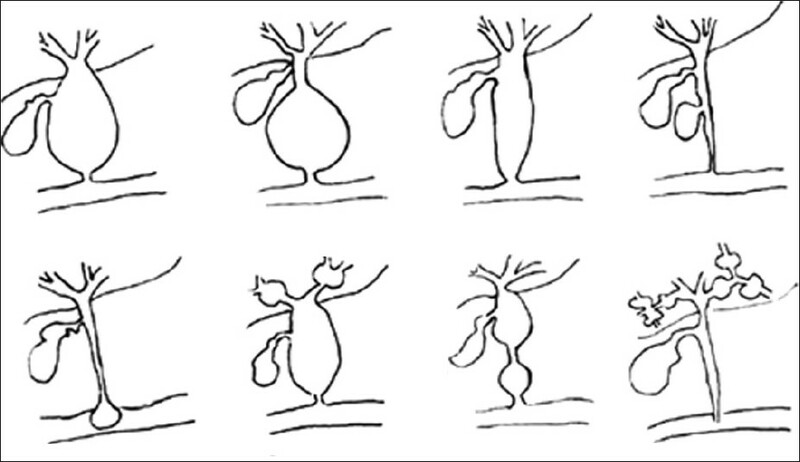 Background/Aim: We report the results of a short- and long-segment cardiomyotomy for relief of the symptoms of achalasia. Patients and Methods: From 1997 to 2009, 41 patients (22 men, 19 women) with achalasia underwent cardiomyotomy. Patients were divided into 2 groups [short-segment group (SSG) and long-segment group (LSG)]. SSG include 22 patients with laparotomy and 8-cm short-segment myotomy and Dor fundoplication. LSG includes 19 patients with thoracotomy and 12-cm long-segment myotomy and Belsey partial fundoplication. Results: Median follow up was 48 months (range: 12-70 months). Postoperative dysphagia improved in 20 patients in SSG and in 17 patients in LSG (P < 0.001). Slow emptying sensation improved in 19 patients in SSG and in 16 patients in LSG postoperatively (P < 0.001). Heartburn was present in 2 patients in SSG and 3 patients in LSG postoperatively (P = 0.179). 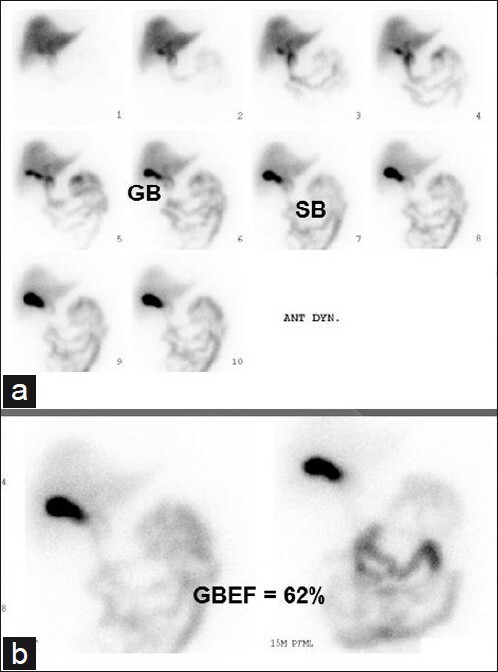 Radiologically, barium stasis decreased significantly from 88% to 25% in SSG and from 85% to 30% in LSG. The lower esophageal sphincter (LES) gradient decreased from 32 to 10 mmHg in SSG and from 34 to 14 mmHg in LSG (P < 0.001). Conclusions: Short-segment cardiomyotomy reduces the LES gradient and relieves obstructive symptoms. Background/Aims: Patients with inflammatory bowel disease (IBD) are at high risk for low bone mineral density (BMD). This study aimed to evaluate BMD in IBD patients and its relationship with bone metabolism in a group of Iranian patients. Patients and Methods: A cross-sectional study was conducted on patients with IBD to assess BMD status and serum biochemical factors. After getting the demographic data from 200 patients, they were screened using dual-energy X-ray absorptiometry of the lumbar spine (L2-L4) and femoral neck for BMD status. Serum levels of calcium, phosphate, alkaline phosphatase (ALP), and 25-hydroxyvitamin D (25-OH vitamin D) were measured to assess the bone metabolism status. Results: Two hundred patients with IBD were enrolled in the study. One hundred and eighty three (91.5%) patients were identified as having ulcerative colitis (UC) and 17 (8.5%) as having Crohn's disease (CD). Based on the lumbar and femoral neck bone mass densitometry, 148 (74.4%) patients had low BMD at either lumbar spine or femoral neck. Of these, 100 patients (50.3%) were osteopenic and 48 patients (24.1%) were osteoporotic. A 58.6% and 61% of patients with UC had low BMD in the lumbar and femoral neck, respectively. These results for those with CD were 76.5% and 70.6%, respectively. 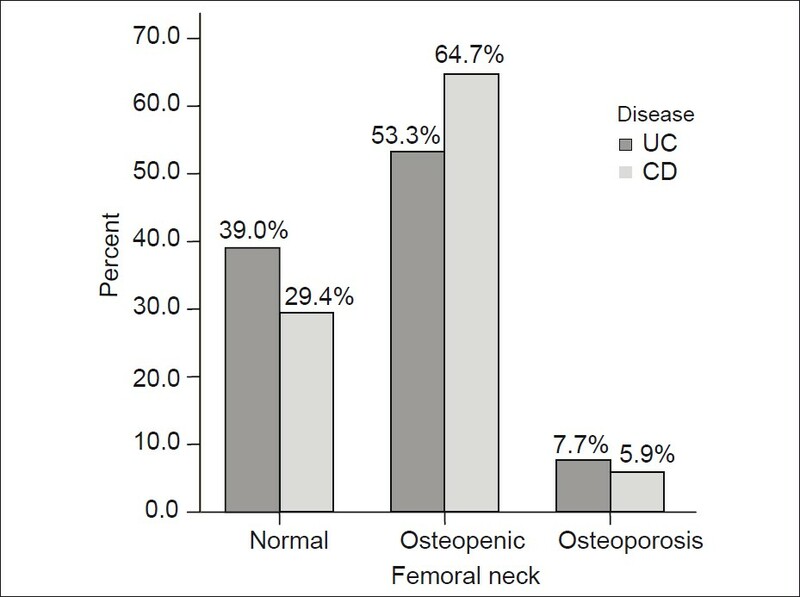 The mean of femoral neck and lumbar T-scores in patients with UC were -1.14 and -1.38, and in patients with CD were -1.24 and -1.47, respectively (P > 0.05). The mean (±SD) levels for calcium (Ca) in UC and CD were in the normal range. The mean (±SD) levels of ALP and 25-OH vitamin D in both the groups were in the normal range, and in comparison between groups (UC and CD), no significant differences were observed (P = 0.20 for ALP and P = 0.44 for 25-OH vitamin D). In the assessment of correlation between biochemical markers and BMD, an inverse correlation between lumbar T-score and ALP or 25-OH vitamin D only in patients with UC was observed. Conclusions: The high prevalence of low BMD in the Iranian population with IBD needs attention. The subclinical vitamin D deficiency may contribute to bone loss in IBD patients, which is more pronounced in patients with UC in this study because of the small population of patients with CD. Background/Aim: The objective of this study was to assess the value of hepatobiliary scintigraphy (HS) for the diagnosis of right upper quadrant (RUQ) abdominal pain in patients with normal hepatobiliary ultrasound (HU). This is an observational study with a retrospective analysis of data from March 2008 to August 2010. Materials and Methods: We reviewed the HS results of 30 patients, aged 29-69 years (average 45.8 years); 12 male and 18 female patients. 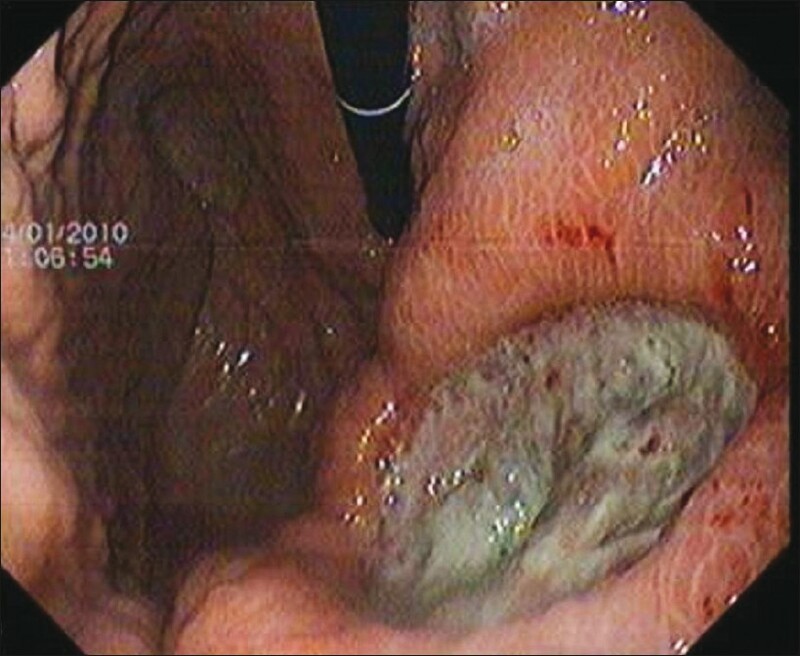 Patient selection to perform the HS was RUQ abdominal pain, suspected hepatobiliary disorder, and negative HU. All patients had gone through the standard procedure of HS. Results: Based on predefined interpretation criteria, HS results were divided into 2 patterns: Normal (n=8, 25.8%) and abnormal (n=22, 73%): 18 patients (81.8%) having early gallbladder (GB) and common bile duct visualization, and delayed transit to small bowel (SB), which can be seen only after a fatty meal with normal or abnormal GB ejection fraction (GBEF) pattern characteristic of Oddi's sphincter dyskinesia. The remaining 4 patients (8.18%) had acalculous cholycystitis pattern: Delayed GB visualization with activity appearing in SB before GB. Conclusion: HS with fatty meal stimulation and GBEF estimation seems to be a reliable test, which may reveal a biliary cause in more than 70% of patients with RUQ abdominal pain and normal HU. Normal results exclude functional biliary cause. The decision for invasive or noninvasive therapeutic approach may depend on the results of HS. Background/Aim: Collective evidences suggest the causal association of Helicobacter pylori infection with iron deficiency anemia. Generation of free radicals against this bacterium can lead to turbulence in oxidative-antioxidative system. 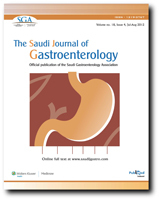 This study was undertaken to evaluate the marker of oxidative protein injury, protein carbonylation, and total antioxidant status in anemic H. pylori0-infected patients and to observe the alteration in them after treatment for 1 month with oral ferrous sulfate and anti-H. pylori therapy. Twenty anemic H. pylori-infected patients were randomly divided into 2 groups. The H. pylori-infected patients in Group I received both iron supplementation and anti-H pylori therapy, whereas patients in Group II received only the iron supplementation. Fifteen healthy volunteers served as controls. All the study parameters were estimated after 1 month of the treatment. Materials and Methods: Protein carbonylation and total antioxidant status were estimated using colorimetric method. Hematologic parameters were evaluated using Sysmex-K-100 automated cell counter. Results: In anemic H. pylori-infected patients, the protein carbonyls (PCOs) were significantly increased, whereas the total antioxidant status, iron, hemoglobin, and ferritin levels were significantly decreased compared with the controls. In Group I, while the PCOs level decreased significantly, there was a significant increase in the total antioxidant status, iron, hemoglobin, and ferritin levels after 1 month. No significant alterations were noted in the levels of PCOs, total antioxidant status, iron, hemoglobin, or ferritin in Group II patients after 1 month of the treatment. Conclusions: The findings from this study indicate that treatment for both anemia and H. pylori infections is required for lowering the oxidative stress markers, which synergistically bring about an appropriate correction of anemia soon in these patients. Background/Aim: Thrombocytopenia is a common finding in patients with cirrhosis and may lead to unnecessary referral for bone marrow (BM) biopsy. To date, the prevalence of cirrhosis in patients with thrombocytopenia who receive BM biopsy is largely unknown. Materials and Methods: Between fiscal years 2006-2010, 744 patients (≥18 years) who underwent BM biopsies for thrombocytopenia at our hospital were identified retrospectively. 541 patients were excluded who had hematologic malignancies and received chemotherapy. Remaining 203 patients with predominant isolated thrombocytopenia were included in the study. Results: Of 203 patients, 136 (67%) had a normal and 67 (33%) had an abnormal BM examination. Prevalence of cirrhosis in the study population was 35% (95% CI: 28.4-41.9). 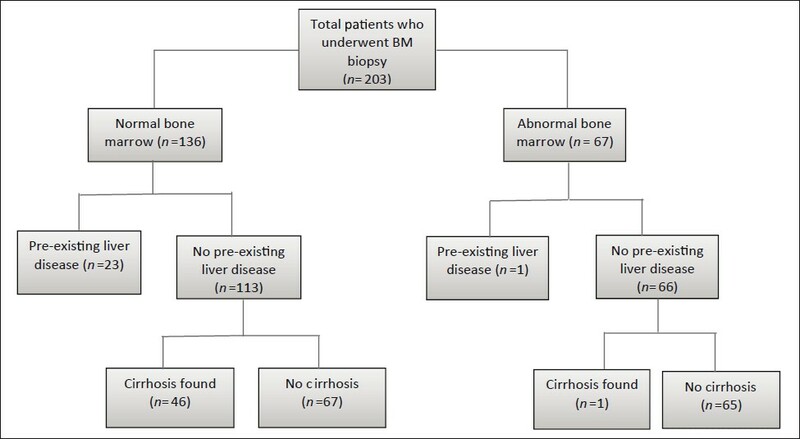 51% patients with normal BM were found to have cirrhosis compared to 3% of patients with abnormal BM exam (P < 0.0001). Common causes of cirrhosis were nonalcoholic steatohepatitis (NASH) (47%), followed by alcohol and Hepatitis C virus infection. Idiopathic thrombocytopenia and myelodysplastic syndrome were most frequent causes of thrombocytopenia in patients without cirrhosis. Patients with NASH had higher body mass index (BMI) (33.4 vs. 25.8, P < 0.001) and lower MELD scores (11.1 vs. 16, P = 0.028) when compared to non-NASH patients with cirrhosis. Conclusion: Approximately, one third (35%) of patients with cirrhosis induced thrombocytopenia may undergo unwarranted BM biopsies. Clinical diagnosis of cirrhosis is still a challenge for many physicians, particularly with underlying NASH. We propose cirrhosis to be the prime cause of isolated thrombocytopenia. Background/Aim: We investigated the effect of bone marrow-derived stem cell (BMSC) transplantation on carbon tetrachloride (CCl 4 )-induced liver fibrosis. Patients and Methods: BMSCs of green fluorescent protein (GFP) mice were transplanted into 4-week CCl 4 -treated C57BL/6 mice directly to the liver, and the mice were treated for 4 more weeks with CCl 4 (total, 8 weeks). After sacrificing the animals, quantitative data of percentage fibrosis area and the number of cells expressing albumin was obtained. One-way analysis of variance was applied to calculate the significance of the data. Results: GFP expressing cells clearly indicated migrated BMSCs with strong expression of albumin after 28 days post-transplantation shown by anti-albumin antibody. Double fluorescent immunohistochemistry showed reduced expression of αSMA on GFP-positive cells. Four weeks after BMSC transplantation, mice had significantly reduced liver fibrosis as compared with that of mice treated with CCl 4 assessed by Sirius red staining. Conclusion: Mice with BMSC transplantation with continuous CCl 4 injection had reduced liver fibrosis and a significantly improved expression of albumin compared with mice treated with CCl 4 alone. These findings strengthen the concept of cellular therapy in liver fibrosis. Background/Aim: To evaluate the immunohistochemical expression of proliferating cell nuclear antigen (PCNA) and CD34 in colorectal adenomas and carcinomas, and to correlate this expression with different clinicopathologic parameters. Materials and Methods: The study was retrospectively designed. A total of 86 tissue samples, including 33 paraffin blocks from patients with colorectal adenomas, 33 paraffin blocks from patients with colorectal adenocarcinomas, and a control group of 20 samples of nontumerous colonic tissue, were included in the study. From each block, 3 sections of 5 ΅m thickness were taken, 1 section was stained with hematoxylin and eosin (H and E) and the other 2 sections were stained immunohistochemically for PCNA and CD34. 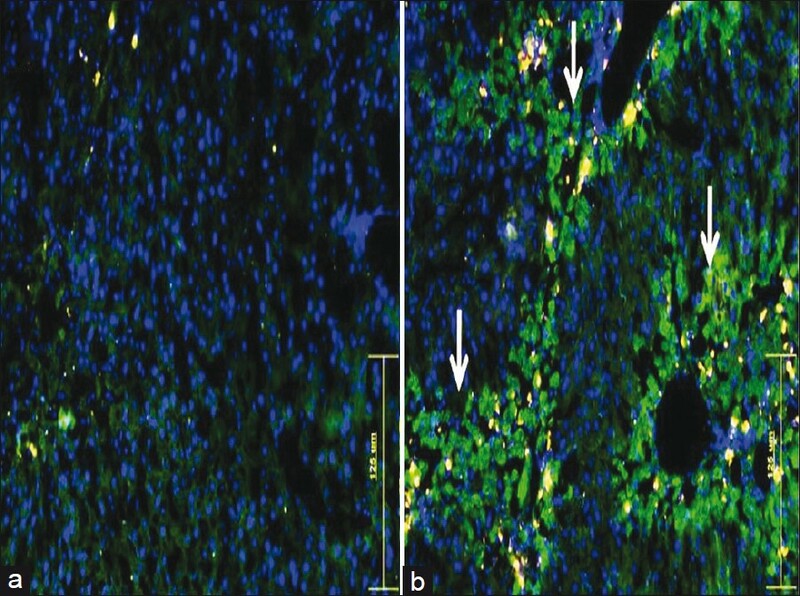 Scoring of the immunohistochemical staining was performed using a specified automated cellular image analysis system (Digimizer). Results: PCNA expression was significantly increased in a sequence of normal mucosa-adenoma-carcinoma. It was significantly higher in adenomas ≥ 1 cm and those with severe dysplasia, and it showed a significant positive correlation with grade and lymph node involvement in colorectal carcinoma. CD34 showed significantly higher expression in carcinoma than adenoma and in adenoma than in the control group. CD34 expression showed a significant correlation with adenomas carrying severe dysplasia and large-sized adenomas (≥1cm). It was significantly correlated with tumor grade, lymphovascular invasion, and lymph node involvement in colorectal carcinoma. Conclusion: PCNA plays an important role in colorectal neoplastic progression and can be utilized as ancillary marker for the risk of malignant transformation in colorectal adenomas as it correlates with high grade dysplasia and size. Intratumoral quantification of the mean (A and N) of CD34 in colorectal carcinoma reflects the grade of tumors and can predict lymph node involvement and lymphovascular invasion, to make a useful additional prognostic factor. Hepatitis B virus (HBV) reactivation is a well-recognized complication that occurs in lymphoma patients who undergo chemotherapy. Only very few cases of HBV reactivation in patients with isolated antibody against hepatitis B surface antigen (anti-HBs) have been reported. We present a case of a 78-year-old woman diagnosed with diffuse large B cell non-Hodgkin's lymphoma who only displayed a positive anti-HBs, as the single possible marker of occult HBV infection, before starting therapy. She was treated with several chemotherapeutic regimens (including rituximab) for disease relapses during 3 years. Forty days after the last cycle of chemotherapy, she presented with jaundice, markedly elevated serum aminotransferase levels, and coagulopathy. HBV serology showed positivity for HBsAg, anti-HBc and anti-HBs. HBV DNA was positive. 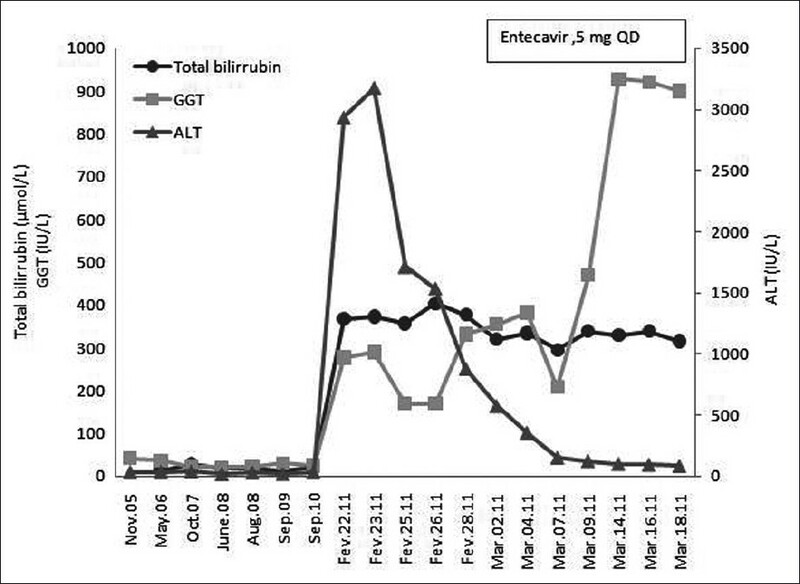 Antiviral treatment with entecavir was promptly initiated, but the patient died from liver failure. A review of the literature of HBV reactivation in patients with detectable anti-HBs levels is discussed. Candida infection of gastrointestinal tract is frequent in immunocompromised patients and rare in an otherwise healthy person in whom no permissive factor is present. Herein is a case report on 25-year-old woman, 2 months postpartum, with fungal gastric ulcer with invasion leading to fungemia. She developed fever and anemia. Gastric biopsy and blood culture both showed growth of Candida albicans. The patient responded well to parenteral amphotericin B. This supports the hypothesis of invasion of Candida from gastric ulcer into blood. Mitochondrial DNA depletion syndromes (MDSs) are autosomal recessive diseases characterized by a severe decrease in mitochondrial DNA content leading to dysfunction of the affected organ. Autosomal recessive mutations in MPV17 have been identified in the hepatocerebral form of MDS. We describe the clinical features, biochemical and molecular results of a Saudi infant with a new mutation of MPV17 and compared the features to those of previously reported cases. We stress the importance of such rare cases particularly in countries with high consanguineous marriage rate.